ipisoft.com • View topic - XBOX360 Kinect - Low frame rate - PLEASE HELP! XBOX360 Kinect - Low frame rate - PLEASE HELP! Post subject: Re: XBOX360 Kinect - Low frame rate - PLEASE HELP! I think that a PC will work more properly than a laptop. More bandwidth. Both Kinects behave the same? Just to check that it's not a broken device. Again - have you tried all USB ports on the desktop? Did you forget to connect the adapter to power outlet by any chance? Both Kinects behave the same, I tried all the ports - from the back or the front, no change. And of course, the adapter is connected to power outlet properly. 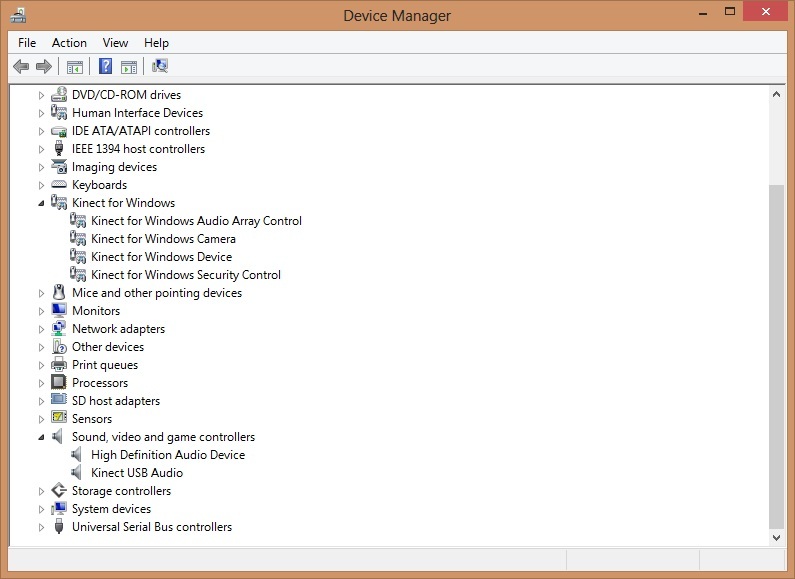 By the way, in the device manager only "Kinect for Windows device" and "Kinect for windows audio control" appears. Nothing else. I guess that the result from the repeated disconnection of the Kinect. Yes indeed, I have Windows 10 :) I tried to uninstall and install all the USB drivers. There is an improvement - one Kinect can reach 28FPS and even 29.7. That's awesome compared to 15FPS, you know. But when I connect 2 Kinects, one is 25FPS (which is not that bad) and the second is 9FPS. I forgot to ask you whether you tried different ports when connecting the second Kinect? As for desktop, have you tried to reinstall Kinect SDK 1.8? It looks more like initialization problem than a bandwidth issue. As for the laptop, yes I tried different ports. I used the 2 USB 3.0 ports I have, they one next to each other. Does it matter? And as for the desktop, yes I've tried again and again to reinstall Kinect SDK 1.8 and checked that I don't leave any bits of drivers when I uninstall them. If you've also got USB 2.0 ports then try them as well - one Kinect to USB 3.0 and other to USB 2.0. My bad. You don't have to help me and I need to be more patient. I tried in the laptop - one Kinect to the USB 3.0 and the other to the USB 2.0, no change. From what the internet told me the regular PC is better than the laptop for the Kinect, right? Maybe you have an idea why in the PC it doesn't work either? When I connect the Kinect to the USB port on the PC, it's disconnecting and connecting rapidly, all the time. It doesn't matter to which port I connect it, 3.0, 2.0. No change. I added images of the device manager, somehow only the Audio Control and the Kinect for Windows Device is appearing. I WOULD LOVE if you have any ideas. I don't have a first generation Kinect at my disposal now, so I cannot check myself. But yes, I remember there were more devices in Device Manager, something like on this screenshot. So it looks like the system does not pick up the Kinect properly. I could blame a faulty power adapter or cable for this, but as it works OK with the laptop then this seems not the case. Have you tried to revert Windows updates on the laptop yet? Have you contacted Microsoft support about your issues? I guess they have more clues about troubleshooting Kinects. It's a bit complicated, but I will try to focus now on reverting the updates on the laptop. And contacting Microsoft sounds like a pretty good idea :) Especially because Windows and the Kinect are Microsoft products, not iPi Soft products. So that what I'll do. I really can't thank you enough for the time and the effort you dedicated for me. It was an honor to talk to an iPi Soft employee and to such a nice guy. The internet needs more people like you.